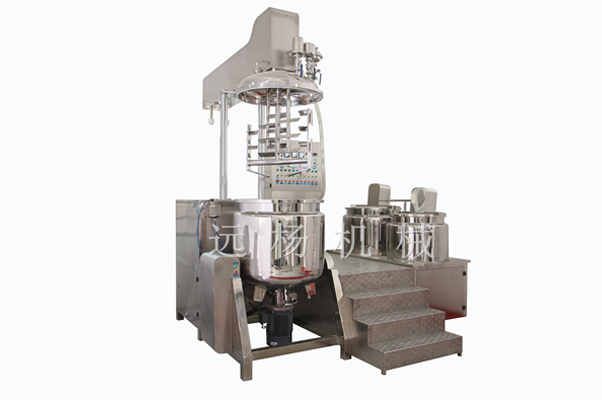 This machine is the introduction of foreign advanced technology, special design according to paste manufacture process of cosmetics, ointment product, the machine is composed of water tank, oil tank, emulsifying pot, vacuum pump, hydraulic system, pouring system, electric control system, working platform and other parts. The machine is suitable for cosmetics factory, pharmaceutical ointment, cream products production, especially for medium viscosity, solid materials with high content of emulsion configuration more efficacies. Equipment operation can be controlled by PLC computer, and according to requirements of users is to record the required production process. It can match other supporting facilities (such as automatic weighing system and remote monitoring system), widely used in some high standard production occasions. The main components are imported, such as mechanical conversion, homogenizing machine seal, CPU, PLC, man-machine interface touch screen, electrical components and stainless steel etc.. Production of cream texture, good fineness, fully meets the needs of high quality products, and by the OEM company welcome. Note: The data in this form due to technical improvement or customized, the real object shall prevail.